The M18 FUEL™ High Torque Impact Wrench is the most powerful 18-volt cordless impact wrench in its class. The POWERSTATE™ Brushless Motor outperforms all leading competitors with constant power output, yet runs cooler with no wearable components. The REDLITHIUM™ Extended Capacity Battery Pack delivers more work per charge and more work over pack life than the competitors. The onboard fuel gauge helps you monitor the charge more accurately, so there’s less downtime on the job. REDLINK PLUS™ intelligence ensures maximum performance and protection from overload, overheating and over-discharge. The 7/16" quick connect allows users fast, secure insertion/removal of auger bits and socket adapters. A new contoured soft grip gives you ultimate comfort during prolonged use. The kit includes the new multi-voltage charger, so you can charge all M12 and M18 lithium-ion batteries with one charger. 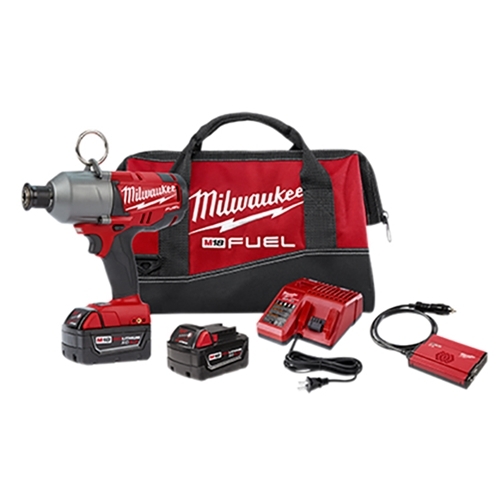 Milwaukee M18 FUEL™ 7/16" Hex High Torque Battery Impact Wrench Kit has a rating of 4.5 star based on 2 reviews.